Panthers unveil Den of HonorThis past weekend, the Florida Panthers unveiled their Den of Honor, a tribute to the brief but colorful history of hockey in South Florida. Among the many exhibits at the BankAtlantic Center is a display that showcases some of the team's early logo concepts — of obvious interest to Icethetics readers. 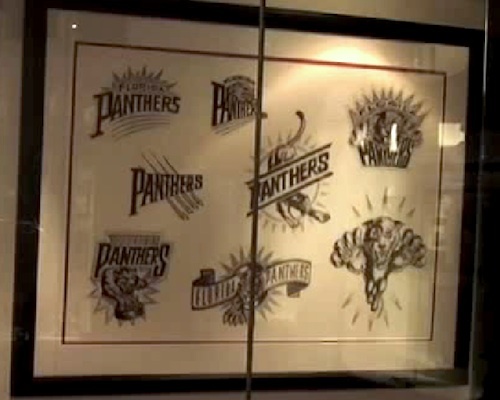 Some early Panthers conceptsIt features two framed canvases with over a dozen different sketches of potential logos, designed back in the early '90s. These images come from a video about the unveiling of the Den of Honor, posted on the Panthers' website Saturday. Click here to watch it. One of the most unfortunate sketches appears to be that of a panther stretching in a downward position, head on the ground and hind quarters way up in in the air. The witless puns almost write themselves. More Cats concepts on displayThankfully, based on the majority of the concepts, it seems clear that management was in favor of a leaping panther. The only question dealt with the positioning of the paws. Take a look at the sketch in the center of this image (right), the differently-positioned paws may be more anatomically realistic, but leave the logo feeling a bit unbalanced. And anatomical realism has no place in sports logos anyway. See the small logo just above that one? It's nice to see they avoided the temptation to go with the three-quarter view — unlike some teams (Ottawa). Personally, I think the Panthers have one of the coolest hockey logos despite its intricacies. And after 17 years it's neat to see the team finally showing us what could have been. Bruins don classicsThe Boston Bruins broke out the Winter Classic threads for the fourth time this season on Sunday. The Bruins donned their specially-designed duds before the home crowd, beating the New York Rangers 2-1 in their first indoor win while wearing gold. At this point, they just need to call it the third jersey — officially. After all, the current black thirds could use replacing. The Bs arguably have the best home and road sweaters in the NHL along with the worst alternate. Whether it returns this fall for the 2010-11 campaign remains to be seen, but it might be a safe bet that we'll see it again before this season is out. All the previous occurrences of the jersey were weekend matinee games. Of course, the Fenway Park game was an afternoon match. The Bs wore the golds next on Saturday, Jan. 23 for a 1:00 PM start against Ottawa and again on Saturday, Feb. 6 for another 1:00 PM start against the Canucks. Yesterday's game against the Rangers started at 12:30 PM. The Bruins now have two more afternoon home games left on the schedule. The first is Mar. 27 against the Flames and the other is Apr. 10 against the Hurricanes. Could it show up again at one or both of these games?